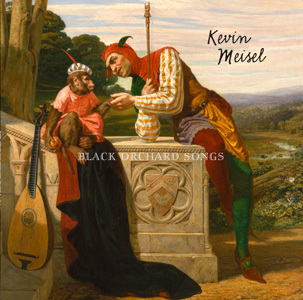 Black Orchard Songs, Kevin Meisel’s fourth release, comes nearly four years after its predecessor, Cruising For Paradise (Brambus, 2007), This new CD is, by all indications, a change of direction for an artist steeped in the narrative tradition of songwriting. The songs here are, in part, love songs to an impossible muse that demands continuous change and artistic evolution. The story of the record’s evolution is woven into the song’s subtexts: The recording emerged on the ill wind of several failed prior attempts to assemble other collections of songs. Discouraged, in the fall of 2009, the artist took retreat to rediscover his muse. The outcome of this immersion is Black Orchard Songs. The pieces that came to form this collection were mostly written on a nylon stringed guitar in a small cabin in northern Michigan. Unsure of their merit, Meisel contacted his old friend and co–producer, Brian Lillie (Country Lines, Brambus, 2003) for counsel. Impressed, Lillie agreed to co–produce the songs. Meisel recorded demos of the pieces in his home studio in the fall of 2010, and in early 2011 those demos were brought to Big Sky Studios in Ann Arbor where full pieces were assembled from the demos themselves. What seems to distinguish these songs from his earlier pieces is a conscious shift toward a kind of language that is elusive and symbolic, even as it is narrative. Moving from the apocryphal and corrupted landscape of Black Money, through the wondering innocence of unlikely love in the double entendre of Out Of Time, toward the nocturnal inquiry of What Do We Owe The Dark? one can sense the acknowledgment of mystery behind the mundane. David Boucher, in his profile of Bob Dylan and Leonard Cohen (Dylan and Cohen, poets of rock and roll, 2004) describes how this acknowledgment of mystery evades reality by tracing the pathway of dreams that lead, in the subconscious, to an unsuspected fact. The facts revealed here seem to be pieces of a map to oblivion where inspiration and redemption, in all its tenderness and cruelty, revitalizes even as it refutes the impulse toward explanation. Musically, the return to an acoustic palette of instrumentation seems to support the contemplative nature of these new songs. Brian Lillie’s light handed production, with it’s weeping violins, harpsichords, and understated adornment serves to accentuate the displaced and nocturnal feel of the compositions while leaving ample space for each narrative to unfold. With the recording’s title, perhaps something of the artist’s intention shows through. There is the implication of fecundity here, and one senses cycles of fertility and decay as the constant pulse inside these songs. A Black Orchard must invariably compel one’s attention toward the earth; to darkness and light and to that which is fertile or fallow. Dreams, and the oddities of symbolic and mythic place are the subjects du jour here; the shifting of the temporal and the emergence and subsequent disappearance of what is taken as reliable is what is being negotiated. These themes, contemporary and universal in their nature, have always been at the heart of what has been called true folk music. Without question, they certainly inform this new collection of lyrical songs.